We took a break from the amazing train ride from Kandy to Ella and back to stop into Nuwara Eliya, a small town up in the mountains of Sri Lanka. This town is often called “Little England”, as the high society of the colony enjoyed the climate in Nuwara Eliya. 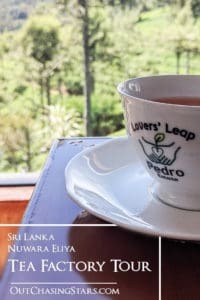 And here in Nuwara Eliya, it’s all about tea. 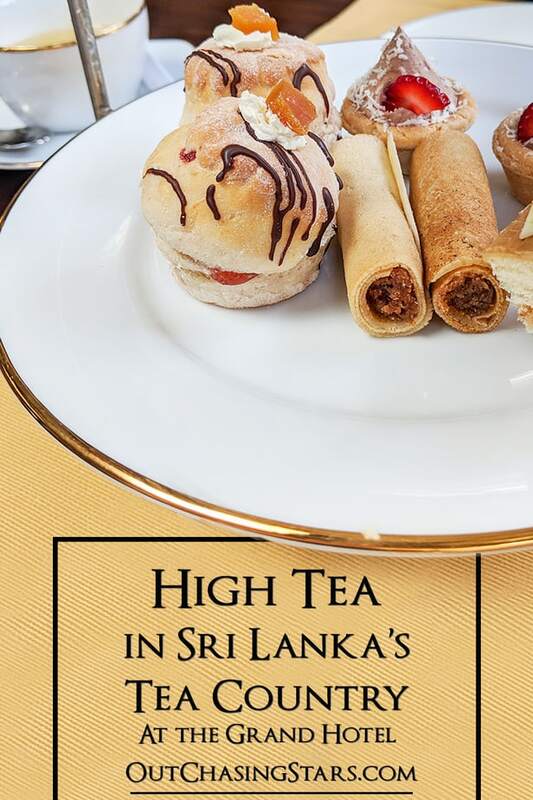 Sri Lanka is the fourth largest producer of tea in the world (behind China, India, and Kenya). 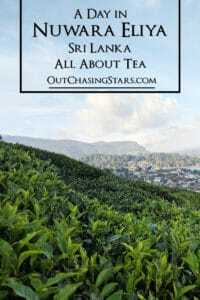 Sri Lanka exports almost 350,000 tons of tea leaves a year. 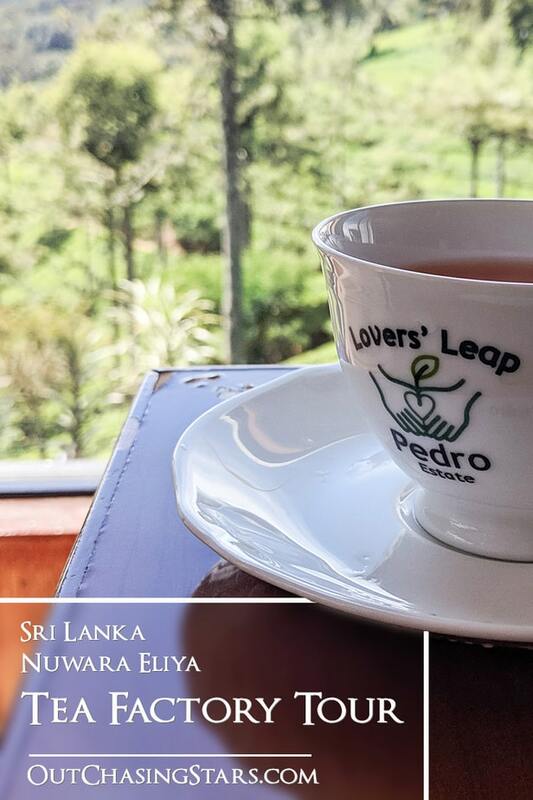 While the first plantation was in Kandy, Nuwara Eliya has become the hub for all things tea. You should know: we packed fleeces on our trip, specifically for Nuwara Eliya, and I wore my fleece all day here. After breakfast, we enjoyed a morning stroll around the Victoria Gardens. For a small fee (300 LKR per foreigner), you gain entry to this small park. Even though it’s early in the year and a bit chilly, there were plenty of flowers to look at around the gardens. Never seen a flower like this; and a tree and bigger than my head! We hired a tuk-tuk to take us to the Pedro Tea Plantation. We arrived a bit early for the tour so we had some time to wander around the tea fields. Then, we donned an apron and hair net to take the tour inside the working tea factory. No photographs were allowed, unfortunately, so you’ll just have to imagine. We started at the scale, where the tea pickers bring their harvest in. The tea leaves are picked every six days. 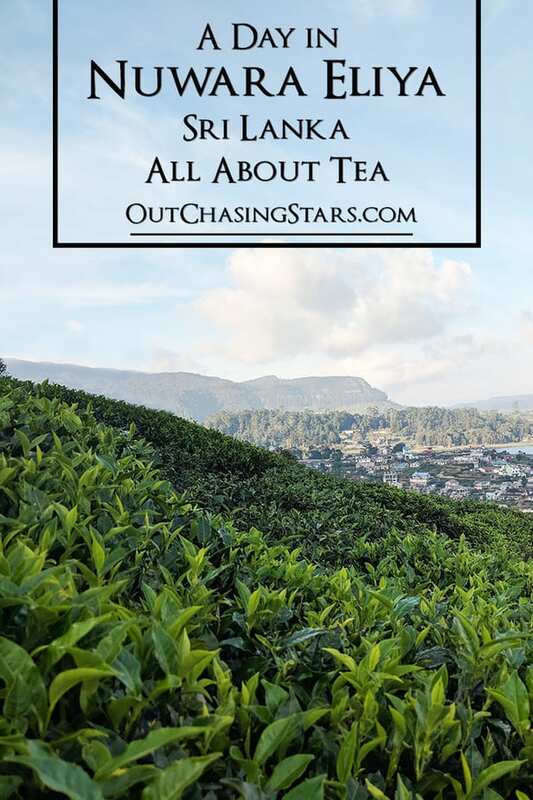 The tea pickers only pick the young, green leaves, so you can identify which fields need picking because the tips of the bushes are lighter in color. Tea pickers work eight hour days, and every two hours they bring their collection in to weigh. On a good day, the scale weighs 15 to18 tons of tea leaves. Next, the factory staff lays out the leaves and dries the leaves with big blowers. The warm air from the blowers removes about forty-five percent of the moisture, and the leaves become limp and pliable. Then, the leaves are rolled in a machine that presses and rotates, literally twisting the leaves around. It smells green and heavenly. Machines separate the leaf segments, and bigger pieces go back into the rollers. Smaller pieces are dried in an oven for 21 minutes. A special machine removes the twigs, which the factory uses for fertilizer. Then the tea leaves are separated by grade, and the grade is what determines the type of tea. The leaves are packed in bags of 50 kilos and given to a broker to be sold to auction in Colombo. After the tour, we got to enjoy a cuppa overlooking the tea fields. 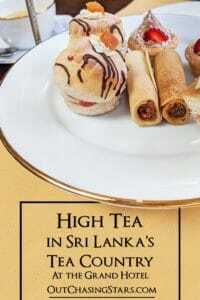 A very popular event in Nuwara Eliya is the High Tea at the Grand Hotel. The Grand Hotel has many restaurants, and the high tea is held in the Tea Lounge and its patio. It starts at 15:30, and I’d read it’s best to get there early to secure a table. However, it wasn’t quite the hustle I was expecting, a few tables remained empty (it was a Monday). Attire is not very formal. I debated about wearing a strappy top or a tee shirt, and settled on the tee shirt, thinking it the more conservative choice. But Nuwara Eliya is touristy enough that a strappy top is probably the better choice (it was also laundry day). The high tea is unlimited tea, and David and I shared four presses, each press about three cups of tea. The staff presented us with a three-tiered stand of finger food; cold savories, warm savories, and sweets. Unlike the high tea I attended in Sydney, this one was more casual, much cheaper, and less food – it lacked the scones with jam and clotted cream. We also poked around the hotel a little bit, and as expected, it’s lovely. Magnolia Restaurant at the Grand Hotel. Single Tree Hill is a lovely short hike up to the top of the hill where there are three radio towers and multiple trees. Looking west, you can watch the sun set over the nearby mountains, and looking east you can see over the town of Nuwara Eliya. It’s also a great opportunity to get up close and personal with more tea plants! The tall mountain in the distance is Pidurutalagala Mountain, which rises to 2524m. We stayed in an AirBNB near the Grand Hotel. We chose this place because we were halfway through our 10-day trip, and needed to run some laundry. For a budget hotel, we would have booked the Heaven Seven or The Hill Town Cottage, both of which are very close to the Victoria Park and Grand Hotel. For a moderate budget, there are two beautiful villas: Lux Wilderness and Villa Tea Fields, but they are both fairly out of town. I really considered booking the Grand Hotel, which is a luxury accommodation in Nuwara Eliya. If it wasn’t for the laundry, I would have – laundry in all of the hotels we looked at is crazy expensive! But the Grand Hotel is gorgeous and glamorous and very centrally located.